Hi friends and family! 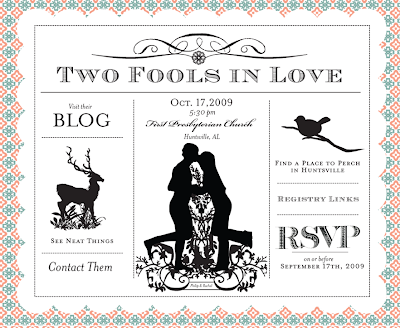 I just updated our wedding website, Two Fools in Love, with new accommodation information. In addition to the Embassy Suites, there are plenty of other places for you to stay, so go have a look. Also, I've had a couple of questions about the registry info. In case you're not on the computer all the time like me, just clicking in the boxes with the store names will quickly take you to our page so you don't have to search around. In fact, any time your mouse is hovering on the web site and turns from an arrow into a finger, that means you can click and be taken somewhere. For instance, on the main page, if you click on the silhouette of me and Philip you will be taken to a page where you can learn more about us. Easy peasy! I have to say, we are getting so insanely excited about the wedding. The tuxes are finally taken care of and Philip and his boys are going to look very snappy. My bridesmaid's dresses are in and being shipped to the ladies for alterations. I ordered my veil today, so the only thing I have left to do is shoes. I am waiting until I get back to Alabama in a few weeks to tackle that because I need my momma for that one! I can't believe I'm getting married. Crazy!